Municipality needs to keep track of 78 development plans for 78 towns. 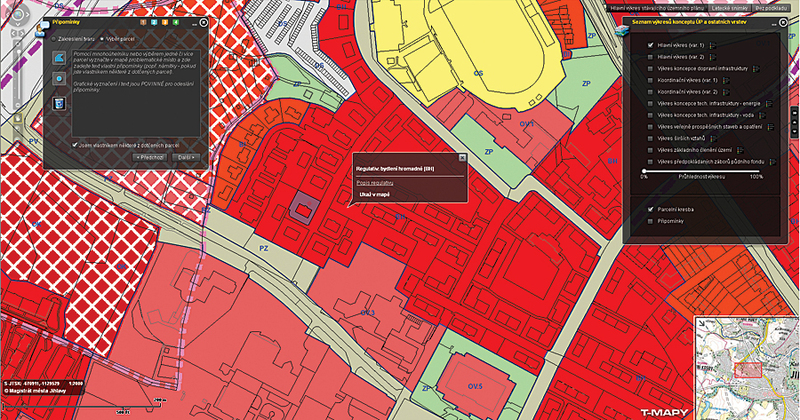 Using GIS, drafts of city development plans are distributed to the widest audience. ArcGIS API for Flex was instrumental in building the dissemination app. The very first public development plan was created in ancient Mesopotamia. From that time, civilization has come a long way, and public development plans are now essential for the growth and changes in every city. 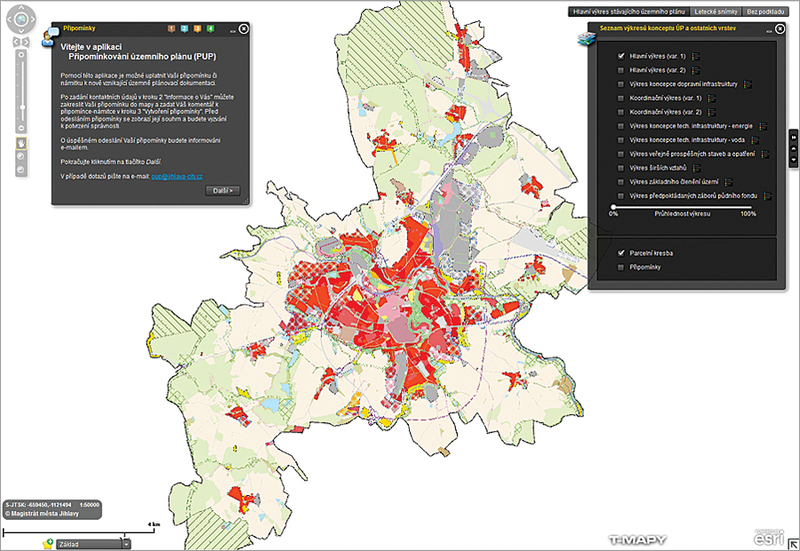 Web mapping application shows the City of Jihlava development plan in an interactive form. The City of Jihlava is a regional center in the middle of the Czech Republic and home for 50,000 people. Multiple-level catacombs, mighty town walls, and many magnificent churches prove the long history of the town that dates back to the Middle Ages. It used to be an important mining center, with rich deposits of silver, and thanks to its position near the busiest Czech highway, it remains an important industrial center. Surrounded by hills and natural beauty, the Jihlava municipality governs 78 towns and villages, every one of which needs its own development plan, an essential document for growth that can help attract investors. Taking care of nearly 80 plans is a difficult task that cannot be completed without proper standardization, workflow, and technology. GIS is a natural choice there. It has tools for importing information from various data sources; storing data in a standardized environment; and visualizing them in a clear, attractive, and comprehensive way. Creating a development plan of the city is a complex task carried out by the city architect, who is cooperating with engineers of various specializations. But the design isn’t just a theoretical project separated from reality. This document will affect the lives of all the citizens. Thus, people from the city must have the opportunity to discuss drafts of the plan and must have a chance to provide their remarks and objections. Distributing the draft of the plan to the widest audience and providing an easy way for submitting objections was the mission that the Jihlava GIS department had to solve. It chose to publish the data with the help of ArcGIS for Server. The goal was to simplify the workflow, increase the efficiency of the planning department, and raise the common citizens’ awareness of the new development plan. Objections could be submitted anytime from anywhere. The web map shows the layer menu and provides handy instructions after loading. Therefore, a web mapping application became essential for collecting objections. A lot of attention had to be paid to the application’s design and usability. Most of the application’s users, the citizens, would have no experience with GIS. ArcGIS API for Flex was chosen as the technology, and development of the application was carried out by Esri Silver Tier Partner T-MAPY of Hradec Kralove, Czech Republic, which already had experience in a similar project for the country’s capital. The design was simple: users could examine various versions of the plan and comment on parcels they selected. After the final check of the entry, the objection was sent into the system, returning a PDF report with the documented objection to the user. Although the process was fairly simple from the users’ point of view, the back-end technology was performing complex tasks. The data was stored in a Spatial Database Engine geodatabase, and the PDF report was created with the department’s document record management system. Receiving objections via web application meant they arrived in the proper format with the required data, which saves the time of users and resources of the office staff. GIS serves as a platform for communication with town office and various IT systems. How to Get GIS to Users? To get the most participation that it could, the GIS department took steps to publicize it. The campaign involved newspaper articles, flyers, announcements in transit vehicles, posters on bus stops, online resources, and social media. As a result, the city development plan soon became one of the most visited pages on the town’s website. Over a four-month period, the system recorded hundreds of objections and was used for a second round during the winter. Now, the application is used for every new project in Jihlava municipality. The project also received eGovernment magazine’s Best 2013 Award in the category of town projects. eGovernment focuses on IT in local and national government. For more information, contact Jan Sou ek, ARCDATA PRAHA, s.r.o..